In 1969 Brazil's National Institute of Space Research (known as Instituto Nacional de Pesquisas Espaciais or INPE) established a stratospheric balloon launch division named "Setor de Lançamento de Baloes" (SLB) to meet the needs of Brazilian scientists through a nationwide scientific balloon programme who still today is unique in the region. Also, that infrastructure is available for use by either foreign scientists or through cooperative campaigns with other agencies and universities around the world. Initially, between 1973 and 1982 launches took place from Sao Jose dos Campos where are located INPE's technical and administrative headquarters. There were laboratories for assembly, integration and testing of scientific payloads and a climatic room for testing the functioning of the circuits at various pressures and temperatures. At that time, the area used for balloon launches was a soccer field located within the perimeter of the base, as seen in the photo at right, graciously ceded to StratoCat by Mr. Nilton B. Reno, who was involved in many of these launches as a technical staff of the agency. The first launch of a stratospheric balloon by scientists in Brazil took place there in June 1968, carrying a payload of 30 kg to study the stratospheric X-rays. The balloon finished it's flight in Southafrica, after crossing the Atlantic Ocean. After this first successful experiment, there was a peak of activity during the first half of the 70's as well in the second half of the same decade. 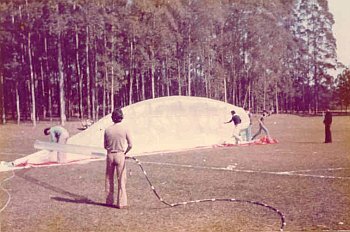 Finally, after two last flights in January 1982, the balloons began to be launched from new facilities located in Cachoeira Paulista as well from alternative sites in any of the numerous airfields located throughout the entire country. 12/27/1977 01:00 ~ 6 h TECHNOLOGICAL FLIGHT Payload not recuperable. 12/15/1978 7:43 utc --- XGAP3 Separation mechanism failure. Payload lost. 1/16/1982 --- MASER 24,5 ghz In Botucatu - Sao Paulo. 1/24/1982 20:25 4 h MASER 24,5 ghz In Santa Branca - Sao Paulo. 1/30/1982 22:34 10 h MASER 24,5 ghz In Teodoro Sampaio - Sao Paulo.